On Friday the newspapers were coyly suggesting that it could snow on the Santa Clara Valley floor, and if not there certainly in the mountains. Above 1000 feet, we'd surely be seeing the white stuff. Last week, I learned the lesson that when they close the road to Mount Hamilton, they close it for bikes, too. So this weekend, with the same goal of just seeing some stinking snow, I decided I'd ride up the nearest big hill: Mount Umunhum. Umunhum got some snow last week, and it tops out at close to 3400 feet, so surely it would be pleasantly snowy, right? Of course not. Mount Hamilton probably got snow; at least the road's closed again. But when Saturday dawned clear and cold, the Santa Cruz mountains were as green as ever. Overnight it was pretty cold, probably cold enough, but there just wasn't much moisture. Well, boo hoo. I was left with a lovely cool-but-not-cold day in late February on which to have a nice long ride. I put on two T-shirts and a windbreaker and set off for Umunhum on my mountain bike. Umunhum is notable because of the huge cubic monolith on its peak. You can see it from all over the valley, and that incongruous and literally unnatural bit at the top stands out like a pimple. As it turns out, the cube is a six-storey concrete support for a long-gone radar dish. It is among the remains of an Air Force station that looked for Soviet ICBMs from 1957 until 1980. When I first moved to the valley, rather close to the mountain, I made it a goal to one day, somehow, ride my bike up there. It took me a few tries, but eventually I made it (as far as one can reasonably go; more about that below), and I've ridden up a number of times since then. To go up Umunhum, you first ride up Hicks. In my case, I was riding from the north, from Camden. Hicks runs next to Guadalupe Creek and climbs gradually, but you hit a notable hill climbing up to the Guadalupe Reservoir. The hill is steep, but probably climbs less than 200 feet. Whenever I'm climbing it, it's hard not to think that if I find this little hill difficult, how am I supposed to deal with the remaining 2500 feet? The reservoir is a local high spot, and the road generally falls toward a pair of bridges where the Rincon and Guadalupe creeks meet. On this day, both were flowing heavily. The road here makes a sharp turn, which marks the start of the climb. From this spot, Hicks is quite steep all the way up to the intersection with Umunhum. The last time I rode up Hicks I was on my road bike, and I struggled. This time, given the cool temperatures and the low gears of the mountain bike, I didn't have too much trouble. To put that in perspective, I still ended up zig-zagging across the road occasionally, but didn't feel the need to stop and catch my breath. Hicks tops out (at about 1400 feet) at the intersection with Mount Umunhum Road, where there's a little parking lot serving the Woods Road trailhead. On this beautiful day the lot was nearly full. Here's a tip: if you ever find this lot full, there's a large parking lot across Hicks in Quicksilver park. It's a little walk, but then that's the point, right? At this point I ate one of my horrible little food pellets (made slightly less horrible because it was a chocolate chip Clif bar) and pulled off my windbreaker. Then back on the bike and up the crumbling road. A little more history is in order. The Lick Observatory on Mount Hamilton was constructed in the 1870s. The materials had to be hauled up the mountain by mules, so the road couldn't be too steep. The Almaden Air Force Station, by contrast, was built in the 1950s, and diesel trucks don't complain as much. The Umunhum road could therefore be steeper, and steeper means cheaper. Actually it's not quite was steep as the north side of Hicks, but it's still pretty steep. On this lovely cool day, the climb was hard but not exhausting, and I made my very slow way up without stopping. Except for pictures. No, really, just for pictures! construction work going on. This one was near the top. Near the start of climb, there were signs indicating that since clean-up work was starting on January 24, 2011, that there would be an increase in truck traffic. Maybe there would be some visible change near the top? Answer: no, no sign of any work, except of course those, er, signs. Midway up the mountain (about 2300 feet) is a gate that marks the end of the line for cars. Well, most cars -- residents, rangers and operators of the communication equipment on the top of the mountain can pass. As I took a moment at the gate to eat another half of a food pellet, a resident (I suppose) came down. I asked about snow the previous night, and got a shrug in response. There's a section shortly after the gate, starting roughly at the intersection with Barlow Road, where the road is especially steep and almost entirely exposed to the sun. I would guess that it runs about 5 miles, but somehow on the map it's only about 500 meters. I have many memories of riding up this thing on warm days, my head threatening to explode in the heat, collapsing in the scant shade of each of the lonely trees on the side of the road. This time, not so bad. A cool day and perhaps slightly better conditioning, and it's only steep, not miserable. After that ramp the grade moderates and the road curves around a bit. Among the curves, you run across the first of several signs indicating that you must not, under any circumstances, proceed any farther. This is reinforced by the existence of a creepy (under the circumstances) collection of mobile homes and trucks and tents and whatnot off the side of the road. The first time I saw these signs, I turned around. The next time, and every time since, I rode right by. My justification for doing so is approximately this: the views near the top are spectacular. One could argue that the road is a public easement, regardless of whether it crosses private land and whether one has valid business beyond it. But the real reason is because it's there. A ranger had passed me on my way up, and just as I was passing Barlow road he came back down. So I didn't much worry about being caught in no-man's land. The section past the signs runs up the eastern side of a ridge, and is surprisingly long,. Eventually it crosses over, at about 3300 feet. At this point, Umunhum Road turns to follow the other (western) side of the ridge, and two dirt tracks head south on either side of it. Umunhum Road continues for a few hundred meters until it meets a gate, which is where I stop. My bogus justifications for coming up this far probably apply to the portion beyond the gate equally well, but so far I've never crossed it. View from the gate on Umunhum. ridge are radio towers and the Air Force Station. Near the gate you are rewarded with expansive views toward the south and west. The foreground is a steep drop into Austrian Gulch and Lake Elsman. The middle ground is the Summit Road area, and in the background are specks of Santa Cruz and Monterey Bay. Toward the west you can clearly see the serpentine trail heading up Ralph's Mountain, and the ridge leading to Mount Thayer. As that ridge turns toward Umunhum you can see the communication towers and the sad ghost town that was once the Air Force station. The fact that the view faces south, and I'm normally here in the afternoon, means that I'm always taking pictures into the sun. If I were a better photographer I'm sure I could capture more of what you can actually see. For example, the bay was dim but quite visible, whereas in my shots you really have to zoom in to see it at all. When I started off on this ride I thought I might, if I felt particularly good, head from Umunhum to Loma Prieta, reversing an earlier ride. I did feel quite good, but on the way up my wife called to say that some tickets we bought a long time ago were (surprise!) for that evening. So I couldn't stay out indefinitely, nor could I return too zonked for a night out. So I decided just to explore this side of the road a little. On the earlier ride I had taken the eastern trail, which looked good on a map but turned out to be an overgrown and almost impassable foot trail. This time I rode down the other ride, which is a fine, single-lane dirt road. It bends around for a few hundred feet and offers excellent views to the south, encompassing a snow-covered Loma Prieta and the bay. Eventually it comes into view of a mobile home. This road is marked as private, and having no need to tempt confrontation (or even inconvenience the residents), I turned right around. The Loma Prieta ridge from Umunhum. Time to head downhill. I put the windbreaker back on and started down. The air, pleasantly cool until now, became piercingly cold as I gained speed and reduced effort. My ears were frozen, and I felt like I might get an ice cream headache. A little way down, at the "no trespassing" signs, the same ranger who had passed me twice so far was parked, talking to a pair of riders and some hikers. I don't know what they were talking about, but one would guess it was something about not being allowed to go any further. Then here I come, riding out of The Forbidden Zone. Awkward. The ranger stopped me, asked me where I'd been, and explained the rules. Despite the signs that were terse, clear and numerous, I claimed to have misunderstood. He let me go with a smile. I'm not sure he could have written me a ticket, but in any case he was quite nice and could have been much more of a pain. I rode back the way I came, which meant that it was downhill almost the entire way. Apart from dodging around a few cars that couldn't maintain the sort of speed I was carrying it was uneventful. In the end it was about 24 miles, with 3200 feet of climbing. The top was about 3300 feet, and I start at 250, so with a little intermediate climbing I think the Garmin may have shorted me. But it's been overestimating my climb recently, so it's only fair. What parts about "No Trespassing", "Closed Area", "Preserve Boundary", "No Through Access", and "Private Property" do you people not understand? The property line is clearly marked on the road much further down from the ridge. And the ridge is private property and closed to hikers bikers. Please respect this. You don't see us marching all over your front or back yard, do you? Despite the unlikely prospect of you'll actually get a chance to read this response, I think you ask a fair question that deserves to be answered. I admitted in the post that I just want to see the views, and my rationalization for going up there is inherently biased and convenient. Nonetheless I respect the property owners' rights, and I wouldn't be riding up there if I didn't think I was justified in doing so. I should also point out that I'm not a lawyer, haven't done much research on the topic, and may be completely wrong. "You don't see us marching all over your front or back yard, do you?" Well, yes, I do. Every day. The sidewalk in front of my house is on my private property. In my neighborhood that's especially clear because there's a verge beyond the sidewalk, so it's clear I own the whole thing. The sidewalk is a public easement; I couldn't stop them from using it if I wanted to. Of course they can't step off onto the grass on either side -- they have a right to use the sidewalk, and nothing more. You see where I'm going with this. I think the road up to the old Air Force Station is (probably) a public easement. The fact that it goes through private land doesn't mean I can't use it; it just means I can't leave it. So is it, indeed, a public easement? Ultimately that would be for a court to decide, as they did with Summit Road. And "ultimately" is coming soon -- when the MROSD opens Mount Umunhum as a park and allows automobile access, will the property owners have the right to barricade the road? 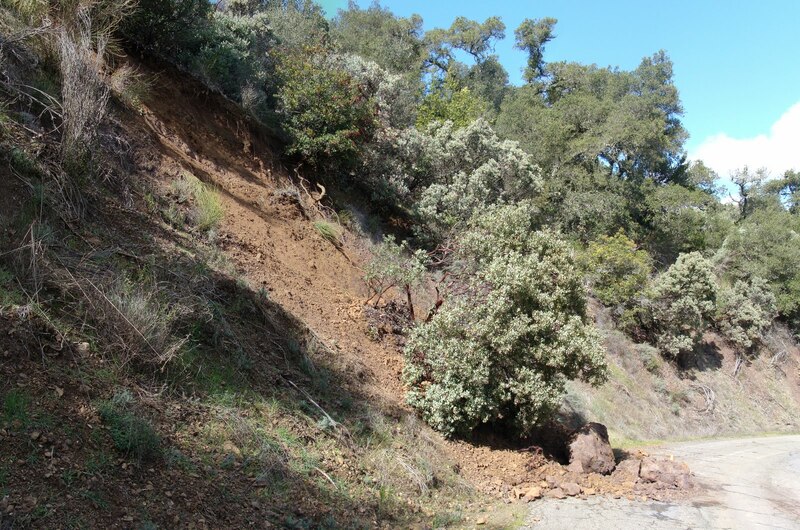 If the MROSD is forced to purchase an easement from the property owners, then I am wrong. If traffic flows without such a purchase (which I expect), then I'm right. No Trespassing: By staying on the road, I'm not trespassing. I should point out here that my little excursion up the Loma Prieta/Umunhum road may be less justified, but about the paved road, I'm comfortable. Closed Area: I'm not sure where this one comes into play. The Air Force Station is marked as a closed area by the MROSD, and I didn't enter. Otherwise, I rode up an open MROSD area to private property, across the private property, and then onto MROSD property again (just before the gate, I mean). This latter area may be closed, but I don't recall seeing such a sign. I don't want to claim purity here, though: I've ignored MROSD "Closed Area" signs in the past. Preserve Boundary: In my reasoning this is irrelevant, because my claim to the road isn't based on it being owned by MROSD. In my view this does explain why I thought the ranger couldn't give me a ticket: when I was doing something contrary to the signs, he had no jurisdiction. No Through Access: As I mentioned, this is coming soon. Not being a lawyer, I'm not sure whether I need to claim to have some legitimate business (apart from enjoying the scenery) beyond the private property. I don't think so, but in any case one could invent marginally legitimate reasons for being up there. An example: fixing the position of the gate on OpenStreetMaps.org. Private property: Yes, there's indisputably private property up there, but I respectfully claim that there's an easement across it. Again, this is all quite biased and convenient, and is a stronger claim to the Mount Umunhum road than the Loma Prieta ridge road. And I'm not going to pretend that I haven't ignored signs elsewhere (there are several examples posted on this blog), but in each case I believe I was only infringing on public MROSD land, not private land. Wrong again... the road is NOT a public easement. It's a private road that the Air Force had to obtain an easement to get up there. The road was never "owned" by the military. It was a series of private easements. When the military left, the easements ceased. You need to research property boundaries more... just go to the county office and request the maps. You'll find that your rides are almost all across private properties. Respect this, please. It doesn't help the situation any when people like you do this. I may be wrong, certainly. But again, it's not a question of private property, which I'm not disputing. As you point out, it's a question of easement. Just to be clear, you're suggesting that the MROSD will be required to purchase easements before opening the top of Umunhum? Hmm... it's not looking good for my argument. Documents on the openspace.org site do indeed indicate that MROSD feels that it needs additional easements on the roads. My fragile reasoning is crumbling. The good news is that the opening of the summit is coming, and with it the public right to travel all the way up to the summit (including by car, unfortunately). I am upset with the lack of clear information set out by the MROSD on their website. They report that the "cleanup" was to be done in spring and the park will be open to the public. Recently we had a neighbor go up to the old radar station I can see from my house in the Almaden Valley. Neighbors and I have assumed that it was open for public and it did have city/private/MROSD land that was open to access now in spite of signs. Unfortunely, MROSD has nothing better to do than criminally prosecute those who are not clear as to what is going on. Their site should be clear and not so wishy washy especially if they are going to crucify young hikers and lookiloos who think that it is open already to the public. Awesome reports, all of them. I tooled around the area quite a bit in high school. I had a blast exploring all the backroads up here on my bike. I wrote the report on Ralph's Mtn, as well as similar reports for other spots in the area (Loma Prieta, Mt Um, Mt Thayer, Cathermola Road, Lake Elsman, etc. I also wrote that comment you linked to in the ryskamp thread. That gate on Loma Umunhum road must be new, that wasn't there a few years ago...the road going up to the houses on the ridge to the west of Mt Thayer also was never paved, but now it's paved, judging from the sat image. Do the ride from Loma Prieta to Alamitos Road. It's awesome and really steep. We called it the "Sick Descent". You have to boldly sneak by a house at the top, but hey, that makes it that much more exhilarating. Cathermola Road was also a very nice ride. This area of the Santa Cruz Mountains is so beautiful and deserves to be enjoyed by everyone. Don't let signs and gates bar you from checking out what's down a road. Everyone has a right to explore their mountains. Again, thanks for bringing back the memories of high school, and never ever stop exploring. Thanks for the encouragement, Mr. Goose Skin. The good news is that the trails up here are getting attention and potential access. The bad news is that the immediate effect of the attention is more vigorous patrols and gates. Ah well. It's certainly fun to explore. are by the same person. I suggest that you put your money where your mouth is and take this to court. But before you do, you may wish to read, if you have not already done so, the judgement of the 6th District Court of Appeal in Burch vs Gombos (July 18, 2000, No. H019557) upholding the Superior Court's judgement on Summit Rd (Santa Clara Co): "The trial court found that the portion of the road in issue has been impliedly dedicated to the public as a result of public recreational use of the road in the 1950's and 1960's." In other words, Burch vs Gombos sets a precedence that almost certainly applies to all of these roads. So, if you *really* believe that these are your roads -- just like the folk on Summit Rd did -- I'd take it to court. Mr Goose Skin - if by some chance you read this, perhaps you could post when you did your riding in this area. Thanks. "We will affirm the trial court's ruling granting injunctive relief to respondents because the court correctly concluded the roadway is now public and it is inappropriate for appellants to engage in “self-help” to restrict the type of public usage." Was there a subsequent ruling you're referring to?